So often on this site I have described the experience of searching for the remains of a church lost to us centuries ago. 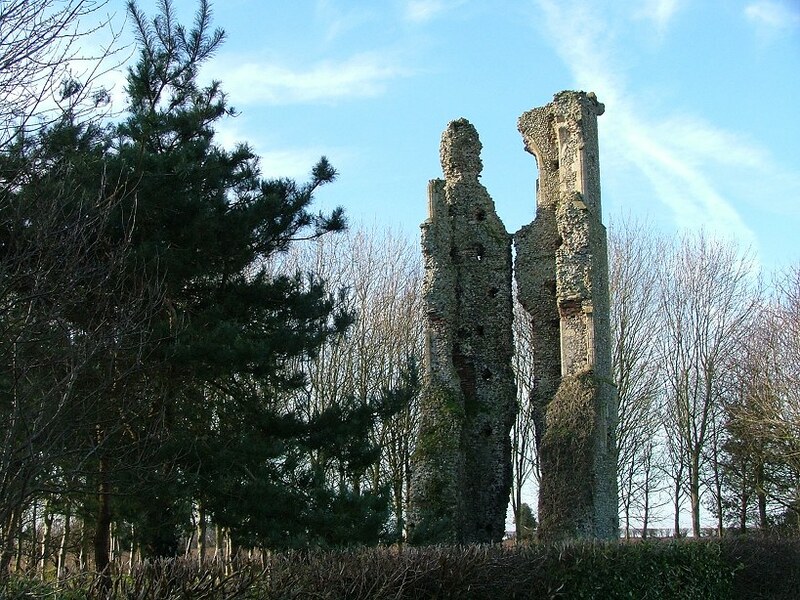 I've written about fighting through nettles and brambles, or crossing private land to look for the last vestiges, the merest dips and hollows, that might hint at the former existence of a touchstone of a Parish. So, it made a change to come to St Andrew, because the two upright corners of its tower stand up like a pair of mighty sentinels that can be seen for miles. 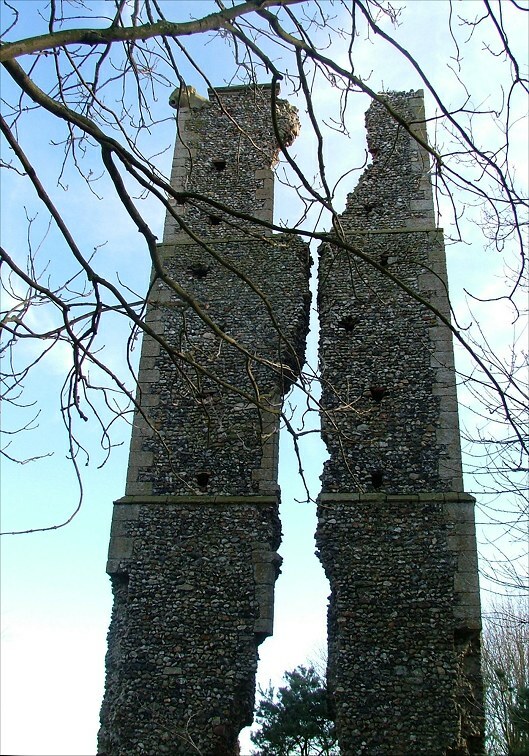 If East Anglia ever gets the urge to have its equivalent of the Angel of the North, or the Wicker Basket of the West or whatever it is called, they could do a lot worse than move the ruins of St Andrew into the central reservation of the A14, possibly somewhere in the Newmarket area. 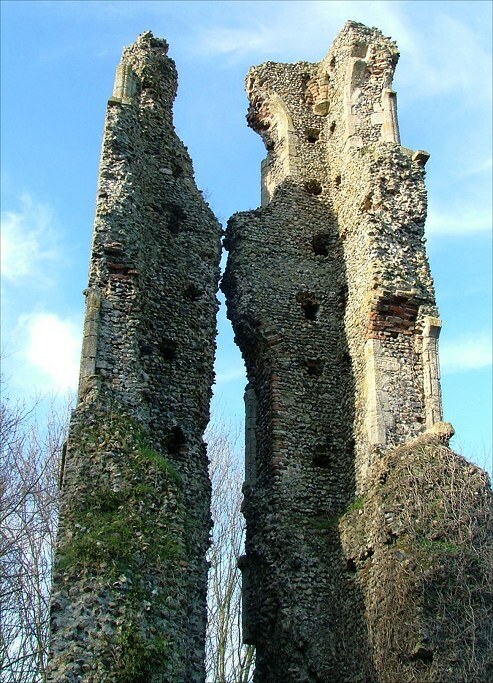 What survives is basically the west wall of the tower, split completely down the middle. The corners are solid, and you also get about half of each of the north and south faces of the tower as well. 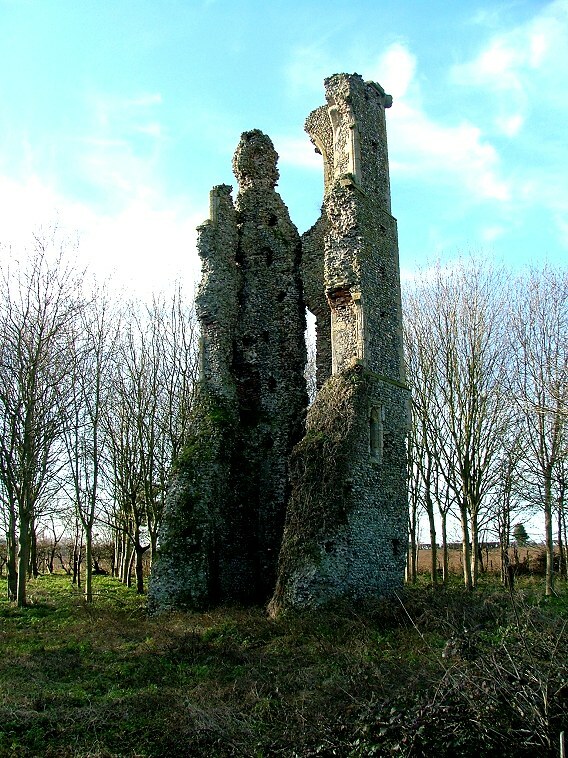 They present something of a puzzle, because if the position of the bell windows is anything to go by, this tower was not square but slightly rectangular, longer from east to west than from north to south. 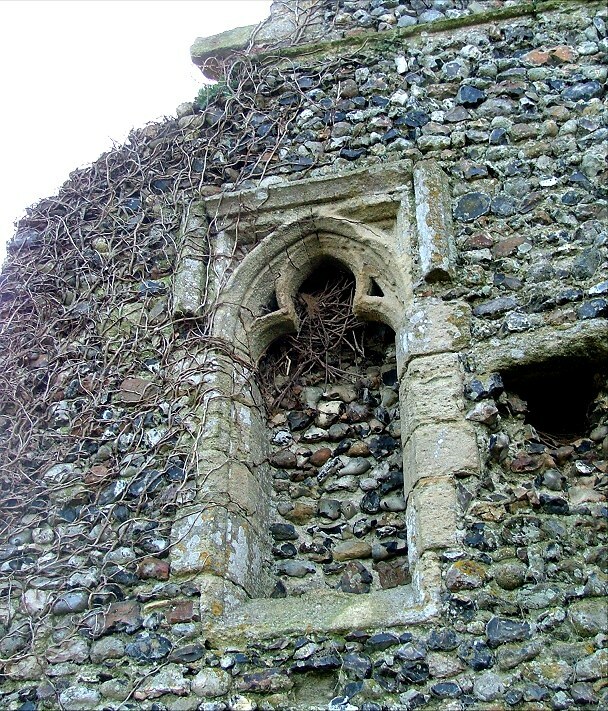 It rather looks as if the demise of the church was caused by the collapse of the eastern face of the tower into the nave, perhaps serving as a reminder that a square tower would have been stronger. 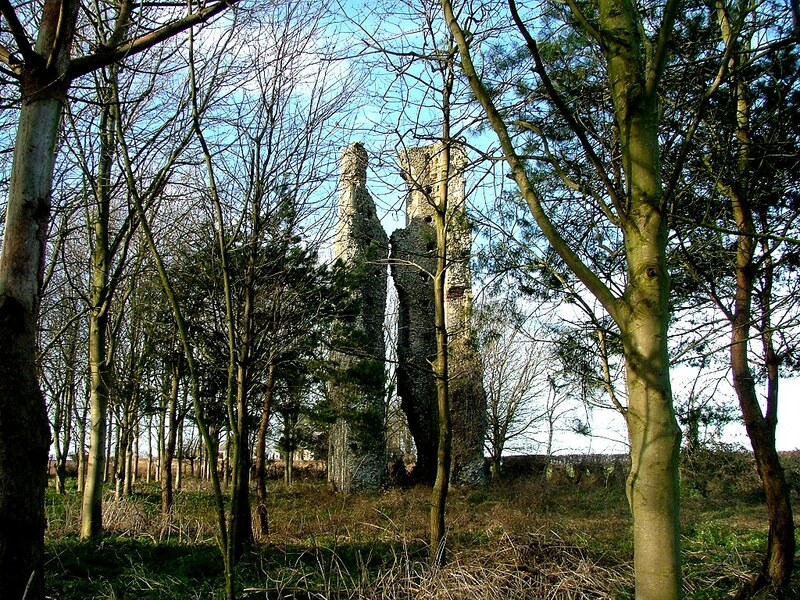 Although this prominent ruin is easy to see, it is rather harder to approach. The area around it is cordoned off with fairly recent barbed wire and planted with young trees. It is certainly possible to get in (although, as this would be trespassing, I cannot suggest you do such a thing) but rather harder to get out, as you have to climb down a slope as you get over the barbed wire. It is easy to see how St Andrew could have fallen into disuse. We are only a few hundred metres from the church of Rockland All Saints here, and there are almost no other buildings within a mile. After the Reformation there must have been increasingly less reason for two churches so close together in such a remote place. 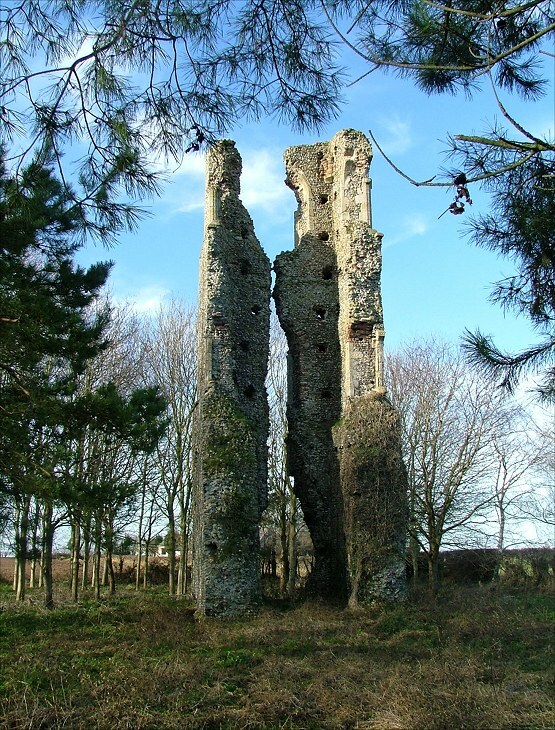 Some churches quietly crumble over the centuries; Kempstone is a perfect example. Others are well used and much loved, but one traumatic incident kills them quickly; think of Norwich St Paul, a busy medieval parish church in 1942, a footnote under the Norwich bypass little more than twenty years later. For most, however, a fall into disuse is soon followed by a fall of a more violent and destructive kind, and that seems to be what has happened here.